What's going on with the Microsoft OS development organization??? After missing the dates on Vista (by 3 years), SP3 for Windows XP (will come out H1 of 2008), they yesterday announced that they'd miss the ship date of Windows 2008 Server, scheduled to be released this November. It has been pushed back to Q1 of 2008. For now. Why do NY Taxi Drivers Hate GPS? The New York Taxi Drivers Alliance announced yesterday that they will strike for 48 hours, beginning September 5th at 5am. The reason? The Taxi and Limousine Commission passed a rule stating that all New York City cabs must have touch-screen display panels, credit card readers, and GPS beginning this year. Many taxis already are equipped with the technologies, which allow passengers to get news, route data, and other information. The striking drivers claim the GPS infringes on their privacy. I just think they'd rather the passenger doesn't know where he is, so they can drive him once more around the block. Read more in this article. I like the idea of GPS in a taxi. It would both convince me that I'm not being taken for a "ride" and assist the cabbie himself in finding his way (last week in LA I had to use my own Blackberry GPS because the driver DIDN'T KNOW how to get to where I needed. He said he "heard of GPS" and it's probably "a good idea to have one", but it's "too expensive"). 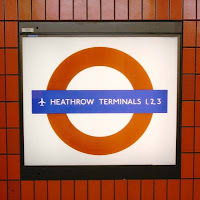 Anyone who's ever traveled to or through Heathrow airport in London, UK (LHR), can testify that it's not a fun experience. The airfield is overburdened, long lines are the norm, lost luggage rate is one of the highest in the world. Expect to leave later than advertised, due to the long lines on the runways. Add to that the heightened security status, and the fact they allow a single piece of luggage on the plane (in the US you can take one bag and your laptop - not so in London - where they'd be happy to check your bag and lose it later - see first paragraph) and you get a fine mess. This Economist article lays down the reasons to this mess and hopes for a soultion within a year (or a t least for some traffic to be diverted elsewhere). Oh, and just in case you thought differently, Gatwick is not much better, according to this article and recent personal experience (nearly 2 hours from arriving at ticket counter till after security). What I personally try to do, if my destination is other than London, is to fly through another European capital (Frankfurt or Amsterdam) to a different UK airport (Birmingham, Bristol and Manchester are much nicer and quieter). For a while now, I've been using CPU monitoring widgets (to read more about widgets, go to my previous post). Problem was, none of them took into account the fact that I had dual CPUs (well, not really, I have an Intel Dual Core 2, but from the operating system's point-of-view, I may well be using 2 CPUs). Finally, there's a widget called Multiple Processor Monitor that can monitor both. Why is it important? Because some applications tie themselves to a single CPU (a feature called "affinity") and drive that CPU's usage up. The widget allows me to focus on the "culprit". BTW, to set the affinity of a process manually, open Task Manager (ctrl+shift+esc), switch to the processes tab, right click a process and select "Set Affinity". This would allow you to tie a specific process to a specific CPU. Affinity can, of course, be set programmatically if you're the developer. 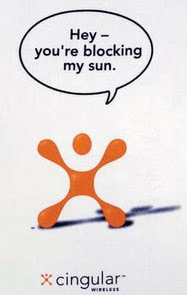 As this Engadget post shows, the iPhone was finally broken out of the Cingular/AT&T prison. It's now possible to change the SIM card and use the iPhone anywhere in the world. The reporter also mentions (jokingly) that it took "too long" for the hack to arrive (to remind you, the iPhone was released on 6/29/07, the hack is from 8/23/07). For years, no changes were made to the Microsoft Scripting Engine. 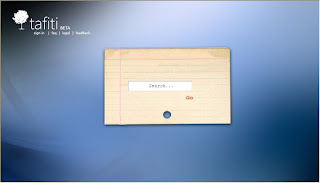 Version 5.6 was released in October 2001, together with IE 6. With the introduction of IE 7 in November 2006, MS included a 5.7 scripting engine. But IE 7 is still not supported by many sites and web applications and is disliked by most IT managers (plus, after trying it you'll rush to install Firefox since it's clearly superior in many ways). Windows Vista already has it pre-installed with IE 7. VBScript - the simple brother of JScript. It does the same things, but speaks a simpler language (a crippled Visual Basic). Has been mostly in use on the server side through ASP. Windows Scripting Host - an underlying layer in Windows that allows accessing, integrating and executing scripts at the system level. Look at my CodeProject article to get a sample of such a script, written in JScript. You can start using WSH right away. In fact, it's much better than running batch files, since scripts can access Windows API, COM components, Windows services etc. And most importantly, can be debugged. To start, just write a script in a text file, rename the extension from .txt to .js/.vbs (depending on the language) and double-click the file. Example: type WScript.echo("Hello World! "); into test.js and double-click it. Your antivirus program may block such scripts, in which case, open a command window and type cscript my_script_filename to execute your script (or set you antivirus to allow script executions). The installer leaves a restore point, so if anything goes wrong, or if you experience any issues with browsing, just restore your system to where it was. If you'd like to start writing WSH scripts, but don't like the idea of starting from scratch, use the Scriptomatic, a wizard-like tool that will create most of the script for you. There's a JScript.Net flavor, that uses the .Net Framework and services from within the script. While it's nice, I haven't seen widespread use of it and it requires the right framework installed to function. I had some problems with lawyers this week. And then, I read a readers comment about companies that make the bulk of their revenue by going after big companies, in the hope of settling out of court. He said (and I misquote): "this litigious society we live in makes me ill. Who can I sue for this?" Apparently, in some cases, the local mutex variable is optimized out, making it ripe to be garbage collected. The result? The next instance does manage to create the mutex, rendering the entire method moot. This is inconsistent (for example, my demo app behaves like expected, other apps don't). The incosistency drove me mad for a couple of days, but I decided to stick with it until I get the result. The solution? make the mutex variable static - that way the GC leaves it alone until the app exits. I've corrected the code of the original post to reflect the fix. To get to the root cause of this problem, I've used Visual Studio, Process Explorer (to see which mutexes are being held by which app), a software that shell remain nameless and a lot of help from my friend Jeff. 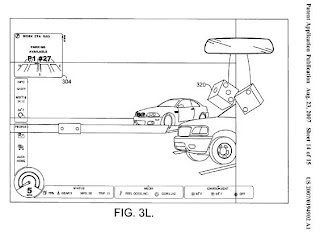 Microsoft applied yesterday (Aug. 23rd 2007) for patent #20070194902. While they call it "Adaptive heads-up user interface for automobiles", it includes the device shown in the diagram above - essentially smart Fuzzy Dice. Google today released a new version of Google Earth that allows you to look upward, and search for planets, stars and galaxies. They use telescope pictures of the universe, much the same way they've been using satellite pictures to show the earth. More can be found here. 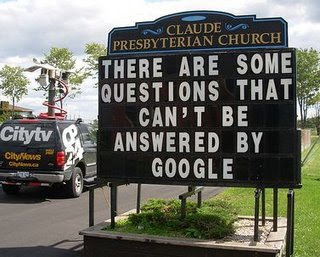 Download the latest Google Earth here. One of my favorite download sites is FileHippo.com. The site lists it's download by categories, and allows you to see new versions of tools and change logs - so you can decide whether to upgrade or not. You've upgraded but don't like the current version? FileHippo will give you up to 10 versions backward to download. You can also subscribe to RSS feeds, to get notified about new softwares, or download their Update Checker tool, which will alert you to any update available for any of the tools you've downloaded already. I'll recommend many tools listed on this site in the future. My computer is full of freeware and shareware utilities, tools, games etc. very useful apps, for just the right price :) So I've decided to share them with you guys, in a set of posts titled "Download This!" Each one will contain one, or more such utilities. The format will include the tool's name, a short description, why do I like it and a download link. All tools are ad-ware and virus free. In the future, you can just search for the "Download This" title, or go to the special label I've just added at http://www.guyvider.com/search/label/Downloads. Also, you can submit comments with tools that you like and I'll include them in a future post. What is it: a tool that lists all the MS Windows updates, patches, hotfixes, what do they solve, what do they contain and how to remove them. Why do I like it: I no longer have to wonder what's in the new patch and can easily resolve problems that have to do with certain components. In my first SilverLight post ("The Flash Killer"), I described how SilverLight supports HD video, as opposed to Flash. As expected, yesterday Adobe announced that the next Flash beta will support 1080p resolution (HD), through the H.264 codec. It still remains to be seen whether Flex (the Flash SDK, allowing for rich content web applications) can compete withe the ease of use and integration of SilverLight. A couple of posts ago, I've discussed a demo SilverLight application. presenting Tafiti - a new interface for Microsoft Live Search. The name means "search" in Swahili (insert your eye roll here). 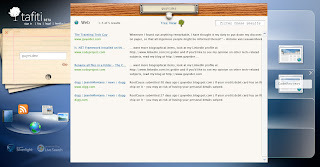 The interface allows searching web, images, feeds, news and books. It keeps your earlier searches (represented as a stack of papers on the left side) and allows you to save links you've liked on shelves on the right, and tag them. PPS: Be careful! Tafity (with a Y at the end) is an ad/spyware site! Found it out the hard way after typing it in. Remember Tafiti ends with an I. 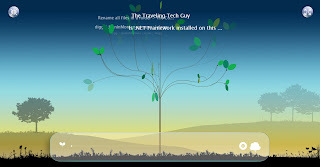 The title of the post describes, according to Joel Spolsky, the 2 qualities you should look for, when hiring technical people. He argues, quite successfully (in my humble opinion and based on my past experience), that we usually settle for the first ("smart") and end up being stuck with people who either can't nail their behind to a chair long enough to finish a project, are not challenged by the work you present them with, or do not work well in teams (a very loose subjective interpretation). Anyway, Joel summarized his entire "thesis" in a small pocket book with the same title. Highly recommended. And while on the subject of hiring technical people, here's another book I highly recommend - even if you never intend to interview a single person in your life. The book "How would you move mount Fuji?" describes the Microsoft culture of asking riddles during an interview, along with 70-something of those riddles and solutions. The writer, William Poundstone explains the pros and cons (mainly cons) of such an interviewing method. Buy the books from Amazon (and I'd get a $0.40 gift certificate :)). 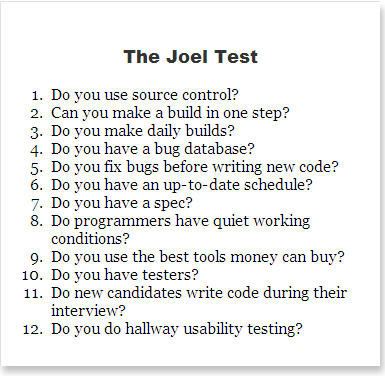 My most favorite Joel Spolsky column is The Joel Test. This is a "highly irresponsible, sloppy test to rate the quality of a software team". 12 simple Yes/No questions are asked about your software development team. A score of 10 or lower means "serious problems" according to Joel. In his post, Joel asks his readers to post their companies' scores. You're welcome to do the same (although I recommend omitting the name of your company). 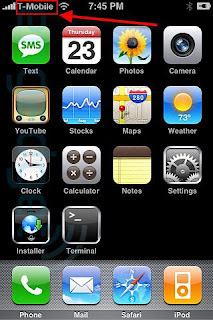 Apparently AT&T (or Cingular as they were known until not so long ago and as is still printed on my 8800) are going to cripple the GPS feature in the upcoming Blackberry 8820. The reason? They don't want the Blackberry to look superior to the iPhone. If it were up to me, I'd change providers right now. Alas, mine is a corporate Blackberry. Yes, I've been referring to its pages for definitions to some of the subjects I cover. But I, like everyone else, kept wondering whether the ability to edit and re-edit articles causes an objective article to become more and more subjective, misrepresenting and even deceitful . In the past, there were cases where private people were accused of editing theirs, or their rivals profiles (or this), but the following research by a CalTech graduate Virgil Griffith confirms our worst suspicions: corporates and government offices are editing articles to reflect the opinions that suit them. Microsoft, Diebold, even the CIA are some examples of organizations that take part in re-shaping our view of the world to fit theirs. Griffith thus downloaded the entire encyclopedia, isolating the XML-based records of anonymous changes and IP addresses. He then correlated those IP addresses with public net-address lookup services such as ARIN, as well as private domain-name data provided by IP2Location.com. Here is a link to the full article and a link to Griffith's WikiScanner - a database of corporations and the Wikipedia articles they've edited. And if you don't have the time to drill down, go to this list of salacious edits for the most famous edits, aptly named Wikidgame (examples: Al-Jazeera adds Anti-semitic comments, Occidental Petroleum clears its past, Haliburton and War Crimes... the list goes on). 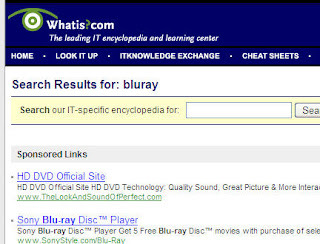 In the future, I'll try to minimize Wikipedia references and concentrate on technical only (although this too is suspect: in my HD DVD post, I referred to both HD DVD and BluRay entries in Wikipedia - completely forgetting that behind these 2 rivaling formats there are 2 groups of companies, fighting for market share - and make no mistake, altering your rival's Wikipedia entry is now considered a fair move in the war). 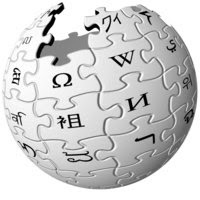 PS: I thought of using whatis.com as a replacement to Wikipedia. I've entered "BluRay" and the first link that came up is for "HD DVD official site" - clearly I can trust no one :) For lack of a better alternative, I'll try to use Google's "define:" tag, and some tech blogs. Avoid resource sharing collisions (your application opens and writes to a file, a second instance would encounter a "file is being use by another process" exception). Pollute a resource with outputs from 2 instances (same file now contains outputs from 2 different applications that look the same). Our server side is not build to deal with 2 clients from the same location. Here is an easy way to ensure a single instance of a .Net application per session. static Mutex mutex;  // <-- corrected 8/24/2007! This adds a global mutex with your application name, since only one such mutex can exist, the next time we try to create it, we'd fail. Since the mutex is a local variable to the main function, it would exist until we exit the program. The code to this demo app can be found here. Is Amazon Trying to Compete with NetFlix? Is this an experiment Amazon is trying in the UK, before running it in the US? If you're interested in hearing what air traffic controllers and pilots talk about, go to http://www.liveatc.net/, a site dedicated to all things ATC. You can listen to live or recorded ATC conversations (the live link is here). Also, on their homepage, they have an NBC piece titled "Gateway Gridlock" that explains how a 15 minutes delay of a plane in JFK causes major delays in ORD and DEN. ATL - which is actually the busiest in the world (86,000,000 passengers a year). ATL, CVG, YUL, SFO - these are the 4 airports I visited last week. If you know what they are (no peeking! this is not a Google contest :)), post a comment. While this blog is not a complete democracy yet, I've decided to let the public have its say. For the next month, you'll find on the right hand side of the blog a poll, asking for your favorite subject/s that you feel I should concentrate on. You can select more than one subject. After 30 days, I'll publish the final results (the interim results can be seen by clicking the link). We've all been there - nothing to do: all documents written, all code compiled, all movies watched. Time to return to our roots (circa Windows 3.1) and sweep some mines. Is Microsoft Planning to Launch a Branded PC? In his MarketWatch column, John C. Devorak strings together a few facts that involve the Xbox as a Microsoft testbed for new technologies, and the fact that an MS branded PC was actually rolled out in India already (with minimal publicity). 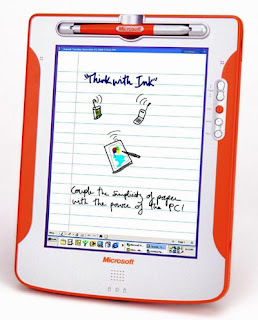 Could it be, he asks, that MS is heading the Apple way, of selling hardware AND software? It makes a lot of sense and I can see how many businesses, already suffering from hardware malfunctions or incompatibilities with their Windows OS, would like the idea of having the hardware and software pre-tested and packaged together. My dentist told me I should brush my teeth every evening for exactly 2 minutes. She recommended I get one of those electric toothbrushes that have a timer on them. Since I already have a toothbrush I like, I just browsed my iPod's music collection, and found that "Song 2" by Blur is EXACTLY 2 minutes long. So every night, I put on my earphones, play Song 2 out loud (and it's a loud song to begin with) and keep my teeth clean. "Enjoy the silence" goes the Depeche Mode song, and with the Bose QuietComfort2 Noise Reduction headphones I got, I can do just that. After reading about, hearing about and seeing them many times on planes, I went to a Bose store and tried them (next to a speaker issuing airplane sounds). What can I say? Until you put them on, you have no idea how much noise you're exposed to on an airplane. These headphones don't come cheap: they cost $300 ($299 in American :)). They work for 30 hours off a single AAA battery. They come with a nice carrying case (that has a place for my iPod Mini) and include plugs for an airplane headphone socket and a stereo system. Just by just putting these ear covering headphones on, you block some of the noise around you. Turn them on, and white noise (such as airplane engine, train, car etc.) will be actively tuned out. You can even disconnect the cord and use this mode for sleep. To achieve maximum noise reduction, attach a sound source to the headphones, which will enhance the sound and block the white noise around. A newer model by the name of QC3 exists (retails for $349) - It has an on-the-ear design and a rechargeable battery. I tested both and went for the QC2 for comfort, and the fact that it's easier to carry an extra AAA battery than a power plant :). I tried using these at a dentist, to block the annoying drills. Mixed results - apparently if the source of the sound is in your mouth, it gets in your head in a different way :). While I do try to read as much as I can to keep updated about tech news, a huge chunk of my life that I spent with no internet access. I mean, of course, the time I spend on airplane and in rental cars. 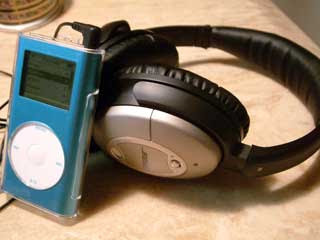 Well, no worries, since I can always take with me my trusted iPod Mini (green version - always reminded me of an Apple :) ), and equip it with the latest podcasts. A podcast is simply a media file (audio or video) attached to an RSS feed. Periodically (based on the author's schedule) such a file would be downloaded automatically to my PC. All that's left is to connect my iPod to the PC and let iTunes synchronize it. But what if you don't have to have an iPod or even iTunes to listen/watch podcasts? - Every MP3 player would do, and any RSS reader could download the media files. So, what does a Traveling Tech Guy listen to? (This Week in Tech) By far my favorite. Leo Laporte's weekly panel of technology experts, discussing all manner of tech news. My favorite is the cranky Jon C. Dvorak. Hak .5 A pair of Canadian hackers will show you how to hack everything: from wireless networks, to RFID chips, to gadgets. Links on the right are subscription links. Add them to iTunes or another RSS reader. If you don't like the formats (audio, video) I've selected, many of the podcasts offer different ones. Use the links on the left to browse to the homepages of the podcasts and locate your favorite format. The homepages would also allow you to download single episodes, without subscribing. Try before you buy :). Videos can be watched on your laptop, if your player lacks video capabilities. Find more podcasts in either iTunes or at Podcast.Net. Finally, if you'd like to subscribe to the entire list (and a few more) mentioned above, download this OPML file into your reader. 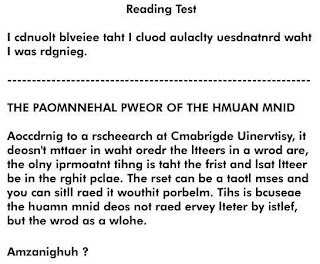 Fill in the captcha (a scrambled text image, that verifies that you're a human and not an evil spam-seeking computer). And from now on, every time I post to the blog, you'll get a nice email. Privacy statement: I will NEVER distribute any email address, nor do I collect them. They are saved on a blind mail server dedicated to subscriptions only. Guy Kawasaki, the original Apple evangelist, wrote a post about a couple of guys making millions from Google Ads by getting eyeballs on their sites. These guys claim they work no more than 2 hours a day. (I guess I need to get my traffic numbers up to get there. Mom! if you read this, please click a Google Ad on the right! :) ). Glenn Kelman, founder of RedFin, replied with an interesting post explaining why he thinks effort, sweat and pain are the way to succeed with a startup. He also details the "10 ways a startup can feel deeply screwed up without really being that screwed up at all". I loved item 1, the reason is evident if you read my last post :). And thanks to my friend Yaniv for pointing me to the post. If you wonder which development language/environment you should use to develop your next enterprise-level web site, read the article Language Wars by Joel Splosky. He discusses 3 language/environment pairs: C#/.Net, Java/J2EE and PHP/Apache and arrives at the conclusion I got to myself: use the one you know best (or have people around you who know it well). Like everything Joel puts out there, an interesting read. Whenever you surf the web, you leave behind you a trail of crumbs on your machine: offline files left in cache, history of the sites you've visited, cookies and in extreme cases downloaded components. From a security/privacy point of view, this is a mess. Anyone who access your computer can learn about your browsing habits, where do you shop, bank, read etc. If you're like most users, you may also have your browser "remember" your passwords for you, meaning access to your online accounts is granted to anyone who has your computer. On the other hand, I probably don't need to discuss the mess of spyware, malware, tracking cookies etc. you're exposed to during a normal day of surfing the web. There are many "security applications" out there that would "block intrusions", "clean after you", "erase tracks" etc., but as Mister Miyagi told Daniel-San: "best defense - don't be there". Don't use your browser. Don't even use your computer. What then...? If you've been reading my earlier posts you know the answer already: use a VMWare virtual machine. 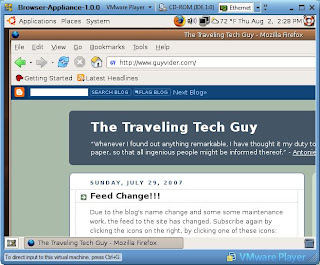 More than that, use the VMWare Player with the Browser Appliance - a VM that contains a minimal operating system (UBuntu Linux in this case) and a FireFox browser. Whatever gets downloaded is trapped in the VM. At the end of browsing just shut it down and start with a new one next time - all tracks gone. And it's free. BTW, this is my 50th post since this site went on the air (well, not technically true, but my lawyer advised taking a specific post out, because it's an ongoing issue). Here's to the next 50!